Hello and Happy Saturday to you! This week at Our Creative Corner, our very own Holly Keen is hosting and she has a fun challenge to try. Tic-Tac-Toe Challenge: "Play along with us in a game of papercrafting tic-tac-toe. Choose "three in a row" on the Tic-Tac-Toe board and make sure you work those elements into your papercraft project. I know this is shocking...but I decided to go with the top row of the "bingo challenge" featuring: Brads, Pink and Flowers. I used the retired Loves Me DSP for the basis for my color combo of pretty in Pink and Regal Rose. Sure it is retired, but let's face it...I think we ALL have those items in our craft rooms that are begging to be dusted off and brought out of retirement. I paired the paper with a fun dimensional flower that I first saw HERE from my friend, Nance Leedy. Before I go, I wanted to share a shot of my boys. It's a little cold here in Texas, so they are sporting their coats in this shot. I might have been bribing them with a "cookie" so that is why they are so attentive. Haha! We sure hope you will join us and play along! Thanks for stopping by and I hope you have a HAPPY day today! Happy sweet Pink, vivid and shocking, seen as energetic youthful, and create a feeling of movement, the colour is fun and exciting. You card is just delicious, and very beautiful. Such a lovely pink confection - eye candy for sure! Gorgeous shades of pink and wonderful DSPs to go with it. Your rosette flower is wonderful and I love the way you placed a pink pearl in the center of the beautiful brad. And your sweet little doggies - I just want to hug them! Thanks for sharing. Hope you will have a fabulous weekend! WONDERFUL! LOVE all that pink and what a fantastic idea to put the pearl on the brad! Stunning card! The "boys" are looking very handsome too! This card popped right out at me in my Googlef Reader. It's sooooo pretty with all the pink goodness and that gorgeous bloom! The pink pearls make the perfect finish! Oh, your boys are darling!! Looks like they were waiting for that camera... How photogenic! First of all, the puppies look soooooo stinkin' cute! I wish I could reach out and hug them! 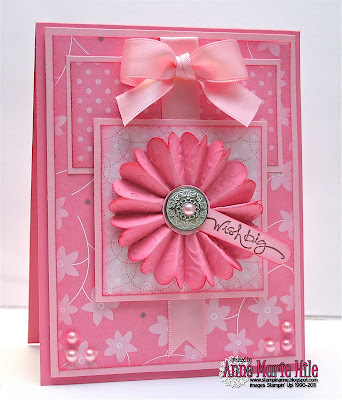 And your card ... well, it's PINK so that makes it perfect and with so much PINK, it takes it to spectacular! Love the card (beautiful) and the puppies!! You do 'pink' so well, how could you not choose it?! Your flower is gorgeous and I love those pink pearls too! Quite the handsome pair you have! So sweet!! Wow, what a fun, happy card. I love all the different elements you used. Beautiful card and i like the monochromatic colors. I didn't know pink was your favorite color... (smile) Love this - so bright and cheery! Such a perfect card to warm up anyone when it's a bit chilly. Love the models you have - so adorable! 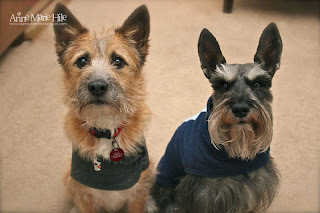 :) Lexi sends schnauzer roos to both! Just beautiful AM! Love the sponged edges of your fan flower--it really makes is pop and those pink pearls are beautiful. I especially like the one in the center of the brad. And how stinkin' cute are those pups? Thanks for the shout-out too! Hope all is well with you...big hugs! Anne Maria, your pink card is to die for! LOVE IT! I love how you used different pink patterns and put them together! how clever! and your dimensional flower is the perfect addition. I really love the pink half pearl on the vintage brad. Your card is simply beautiful! I hope your week is good, my friend. Wow, this card is so beautiful! Love the colours and details :) I really liked the pink flower, amazing! Before I get to the card....those fur babies are so flipp'n cute...yes they are...precious to say the least! I want them! Ok now the card...pretty in pink...like cotton candy! Love the flower...just eye candy! You know I love seeing the pictures of the pups!!!! They definitely want those cookies you're holding!! Now on to the card.........HELLO PINK!!!!!!! Love it!!!!!!! That dimensional flower and the bow just make it wonderful!!!! 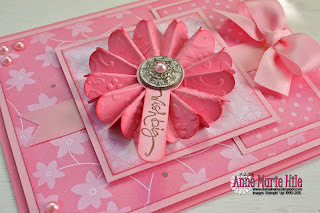 This card is ahhh-mazing so love the, like Anita said, "Candy Cane" feeling!! the ribbon treatment is so pretty!!! What a fabulous challenge and I was assured you would pick pink:) Your little guys are so handsome in their winter attire.